The new 2018 Ford Fusion is a stylish and modern sedan. Fusion is powered by a 2.5L Duratec I-4 engine that puts out up to 173 horsepower. If you crave speed, add in the available 2.7L V6 engine with 325 horsepower and 380 lb.ft. of torque that’s sure to animate any drive. An EPA-estimated 21 MPG city and 32 MPG highway will keep your wallet full during the summer driving season. Your new Fusion is available now at College Station Ford. 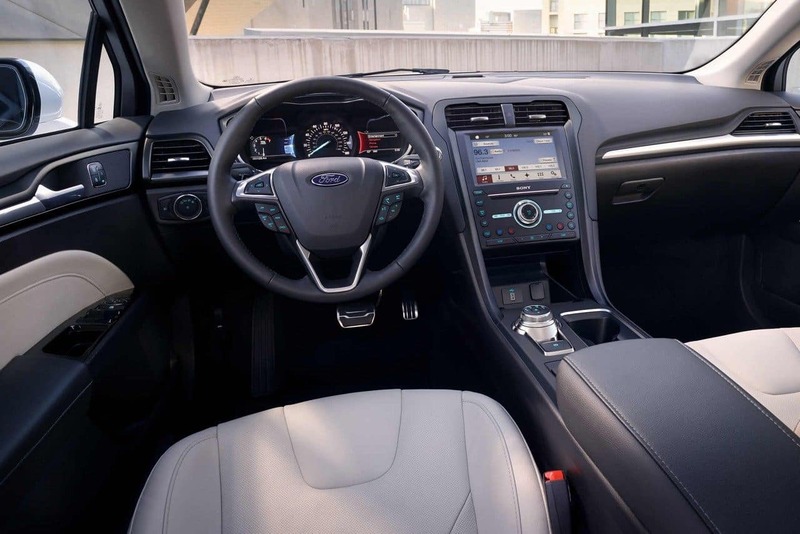 Heading inside the 2018 Fusion, you’ll notice the driver-centric standard instrument cluster, push button start, and dual 12 volt power sockets for phone or tablet charging. Fusion’s ample cabin can seat up to five adults with plenty of room to stretch out. An available 8-inch LCD touchscreen is sure to keep your audio entertaining on those longer trips. Add in available heated front seating for a cozy feeling during even the coldest night excursions. Ford’s recently updated front grille is a classic and refined addition to the Fusion. 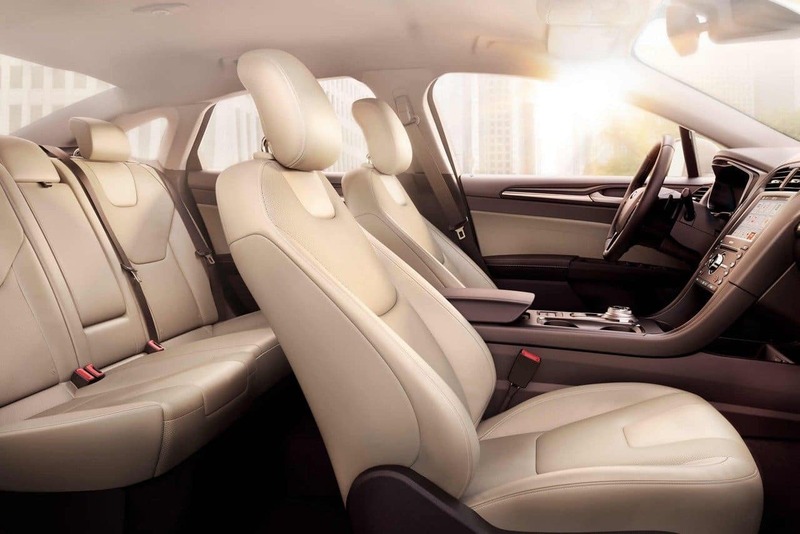 Fusion’s exterior design sensibility is all about its gestural silhouette and angled body paneling. At the rear end, check out the dual exhaust and bright LED taillamps. Fusion is now available in ten different colors, including the striking White Gold or Ruby Red Metallic paints. Strap yourself in, because there are no less than twelve different 2018 Fusion trims to choose from! 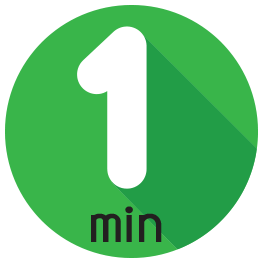 First up is the Fusion S with electric power-assisted steering, a rotary gear shift dial positioned easily within the driver’s grasp, and 16 inch silver painted aluminum wheels. The SE model includes AdvanceTrac with electronic stability control, that creates a more stable and safe ride, and a rear view camera. The Fusion Titanium shows off Sync 3, Ford’s voice-activated smartphone-compatible interface. Sync 3 is even better combined with Titanium’s 12-speaker Sony audio system. The Fusion Sport combines an incredible V6 engine with all-wheel drive for a fierce ride. Finally, the Platinum model will surprise you with its leather seating surfaces, voice-activated navigation, and lane keeping assistance. The previously mentioned models are also available in hybrid variations, as the Fusion Hybrid S, Hybrid SE, Hybrid Titanium, and Hybrid Platinum. The hybrid models deliver incredible performance and fuel economy. Ford has also created several Fusion electric models that get incredible MPGe ratings. The Energi SE, Energi Titanium, and Energi Platinum models deliver an astounding EPA-estimated 104 MPGe highway and 91 MPGe city. Choosing an electric vehicle is easier than ever before with the 2018 Fusion’s advanced technology. 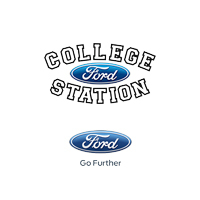 College Station Ford is your local dealership specializing in new Ford vehicles and used models from other leading brands. Locals from Bryan, Navasota, Hearne, and Huntsville have already experienced the College Station Ford difference. Step into a new 2018 Ford Fusion with a dealership associate today for a wonderful test drive. College Station Ford is proudly offering the new 2018 Ford Fusion with a low starting price of just $22,215.